Have you ever wondered where people got those 1UP Mushroom shirts? I've seen them around but sometimes, it's kind of hard to find where to buy them. TV Store Online actually found me and I had a moment of realization. All those t-shirts that I've always loved from shows, games, and movies were all there! Well, then I had a dilemma...what would I choose? There were so many designs I wanted! The tops had humor and fun. The designs were great. I browsed through the Nintendo stuff, Duck Dynasty, Disney, and a variety of movies and TV show sections. Luckily, the size availability of the items really narrowed my choices down for me. That tells you something. If there's something in your size that you want, grab it before it's too late! 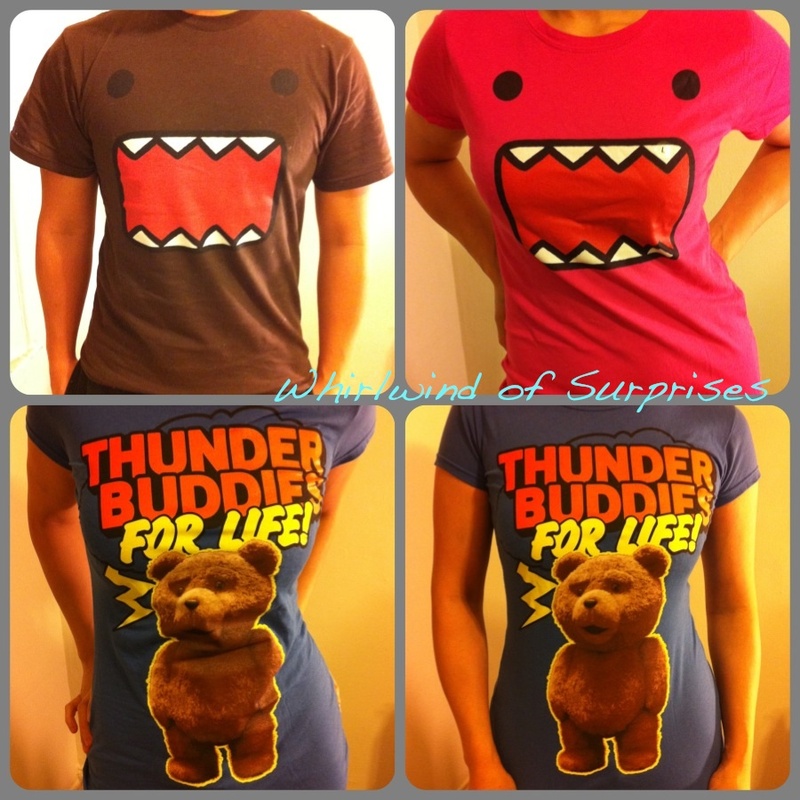 I ended up choosing matching Officially licensed Domo shirts for the SO and I. These shirts were made of soft 100% cotton material that stretched. They were so comfy and cute! Actually, the day we got them, the SO already put it on and started wearing it and I was giving him crap for it since I hadn't been able to take a picture yet. The pups' fur was already sticking to him! Translate it to -he loves it. He actually originally wanted a Ted shirt. It was quite the funny shirt too but unfortunately, that meant it was popular and sold out in his size. I was able to snag one though and it's so typical Ted...Thunder Buddies for life! Ah, I love that movie. The men's sizing chart was fairly straight forward. It was the adult's chart. Then they had Junior and Youth sizing charts. Youth is kind of like your average teenager size. Junior is smaller, more fitted girl or woman sizes. A large on the junior charts equates to your usual S/M from my experience. So check your sizes before your order. Overall, TV Online Store has good quality tees and a variety of choices. However, popular choices run out of stock fast! Buy It: Shop online for Officially Licensed t-shirts from your favorite shows, movies, and games. Win It: One lucky WOS reader will win 3 shirts of their choice (~$75 value). Enter on the Giveaway Tools Form below from Feb 18 10PM EST to Mar 05 11:59 PM EST. Open to US/Canada, 18+. Good luck! Please take the time to enter my other giveaways while you're here.